As we always like to do things a little different; knit nights at Makers' Mercantile® include amusing games, contests and/or raffle drawings. There may even be a fun prize or two! Meet up with friends and come meet some new ones. 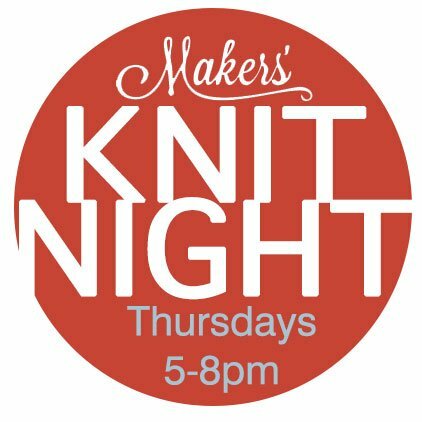 Gather around the shop with a community of fiber lovers to have some relaxed fun and chat about all things knitting. At Makers' Mercantile® we believe that knitting more often, with others that share your passion, can only be a good thing. Knitters are a friendly bunch who like to share all their knowledge. New to knitting? Join us to find the right person or group of people that want to help you progress your skills. Come see what others are making. Learn some new techniques. Get inspired! We welcome all fiber enthusiasts through the door, crocheters, embroiderers, sew-ers, felters, weavers... What are you making?